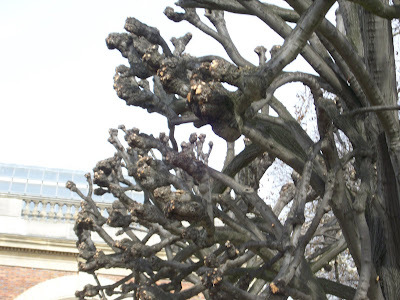 During their recent trip to France my husband and my son took pictures of pollarded trees in the gardens of Paris. Although they think that they went there at the wrong time because the plants are still bare, I personally think that it is the best time to see the distinguished architectural beauty of pollarded trees. The appearance of newly polarded trees may exhibit an ignoble sight with their fresh cuts. Those that have gone through years of this drastic pruning method, however, display an unparalled presence of endurance and persistence through their stubby and gnarled formation. Pollarding is the method of pruning where the top tree branches and stems are cut back drastically. Pollarding starts with a maiden tree, a tree that has not been pollarded. A pollarded tree is called a pollard. Pollarding results in a flush growth of slender shoots and branches which needs to be removed annually. The annual attempt of the tree to grow a scar tissue over the repeated cut, results in the formation of bulges at the ends of the branches. Pollarding is very popular in France especially in urban gardens and parks (I noticed from the pictures). This procedure controls the growth of the plants beyond their space allowances. Pollarding reduces the canopy cover of trees which is important in maintaining the desired level of shade. It increases the resistance of the trees to winds. Root growth is regulated preventing them from being to invasive. Rows of leafless tall pollards look stately in the spring. In the summer I imagine evenly clipped trees that provide a continuous row of shade. This are not common in California where we live...so I wonder how these tall trees are pruned and how much time, manpower, and Euros are spent in pruning them? I guess whatever the cost of maintaining them that they are worth it. Spring is here...even aphids are having a blast in the garden. They have infested my chives and some of my roses. The problem with aphids is that they reproduce so quickly. With the mild climate of California, aphids can reproduce asexually through parthenogenesis (females can have offspring even without males) even faster. It is important to keep checking your plants for infestation - twice a week would be a good idea. It is difficult to get rid of them once the population gets high. They cause the leaves to curl and then use these damaged-leaves as hiding places. 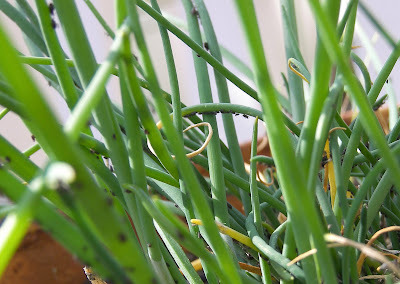 When you observe a trail of ants climbing onto your plants, it is likely that they are tending some aphids somewhere. Ants eat the honeydew that aphids excrete. To get rid of aphids, spray them off with water. They can drown easily. If your plants are delicate, hand spray them with a mixture of one pint of water and 1-2 tsp of dishwashing liquid detergent. Repeat as necessary. To learn more about aphids, the UC Davis IPM Online provides a good resource. Gardening is not all beds of roses. Challenges present themselves from time to time in different forms. As a gardener keep your eyes open to recognize your enemies before they damage your plants. Inspired by the sight of the beautiful cyclamen on the table out in my patio, I decided to post this old old poem about the plant. It demonstrates how pronunciation of a name can be influenced by many factors. Go ahead and read it out loud. Or will the "y" and "a" retort? Or should we emphasize it more? For "y's" a doubtful quantity. Why not "kick-laymen," so to speak? And so he renders it as "Sykes." Stroll in your garden today and pay attention to the colorful language of spring. Appreciate the magical emergence of life and the crescendo of canopies they bring. After giving away so many lemons, this tree still stands laden with large bright yellow fruits. I like harvesting fresh lemons whenever I need one so I could just leave the fruits on. However, today I saw purple flower buds pushing their way out ...which means that those fruits (at least most of them) will have to come off the tree. 1. Harvest fruits before the flowers come out will ensure a good crop for the next season. 2. Prune to remove unproductive branches, allow sunlight to penetrate the canopy, and train the branches to grow towards desired direction. 3. Apply fertilizer under the following conditions: the leaves are yellowish; or when the tree is planted in a pot. My lemon tree is planted on good soil; no fertilization is required. On the other hand, I have two orange trees planted in large pots which need regular application of nutrients. 4. Juice and freeze for future consumption. Lemonades in the summer will be appreciated. 5. Make lemon curd; they are good for pancakes and scones. 6. Share. Give some of your lemons to friends. Beautiful and healthy mushrooms were all over our neighbors' yard last month. They were concentrated on the mulched areas of their garden. This leads me to believe that spores were carried with the mulch. For the gardener, mushrooms are not considered pest, they only grow when the soil is moist. When the season change and the rainfall is less or down to nothing, mushrooms will not grow. Having said so, some gardeners still find mushrooms on their lawns even in the spring or summer. The reason for this has something to do with management practices and it is avoidable. When an area in the yard is over-watered at a frequent interval, the soil remains moist providing a favorable growing media for mushrooms. To solve the problem, irrigate deeply at lesser intervals. It is alright to allow the soil to get close to dry before the next watering schedule. If you have small curious children in the home, teach them that some types of mushrooms are poisonous. As a kid growing up in the Philippines, I played with all sorts of mushrooms (different shapes and colors) in the wild. Since we never ate mushrooms raw, it was not inviting for a little girls to taste them. There was one rule that my grandmother told me which I still remember and apply even up to this time: Avoid all mushrooms with rings on their stem; they are poisonous. However, this is not the only indicator that a mushroom is toxic or not. MykoWeb provides an expansive reference about the different mushrooms in California. All these years I have believed that tomato seeds cannot germinate without being washed and dried first. I was surprised to see "seedlings" inside this tomato...obviously this one did not make it into my salsa. This occurrence was observed in half of the tomatoes in the tray that I bought from Costco. It happened only once so far...but it definitely caused me to wonder. I am not sure what variety of tomato this is. It is a common knowledge that the tomato seeds are coated with growth inhibitors which keep them dormant. Abscisic acid (ABA) inhibits growth and controls dormancy in most seeds. Could it be that this particular variety of tomato has not enough ABA content to effectively impose dormancy? We also know that both producer and vendor have to make sure that their produce maintains good shelf appearance and eating quality. Could it also be that this tomato has been subjected to excessive post harvest treatment that the ABA has been broken down before the produce reached the market? Either way, something went wrong. I would not recommend having tomato sprouts in my salad or in my sandwiches. Neither would you. Although some sprouts (such as broccoli, alfalfa, mungbean, etc.) are considered nutritious, tomato, being in the night-shade family (Solanum), should never be considered as such. Unless it can be proven that the toxic substance in the leaves are processed only upon exposure to direct light. This seven-spotted lady beetle (ladybug or ladybird beetle) has been spotted in my yard. Fortunately, this lady is a gardener's friends. Scientifically it is called the Coccinella septempunctata. Being a predatory insect, the C. septempunctata plays an important role in the biological control of aphids. Both the adult and the larvae feed voraciously on aphids. Adults hibernate or overwinter in protected areas. In the spring when temperatures get warmer, they come out and feed on aphids before they lay eggs. The females can lay up to 1000 eggs within a three month beginning in spring. The females are very strategic in their choice of a place to lay their eggs. They prefer areas with a high insect population such as in gardens, fields and tree canopies. The C. septempunctata is commonly identified by the seven black spots on the bright red elitra (singular elytron: are the tough fore wings of beetles and earwigs). It undergoes a complete metamorphosis. This means that it has to undergo four stages of change to complete its life cycle: Egg; Larvae; Pupa; Adult. 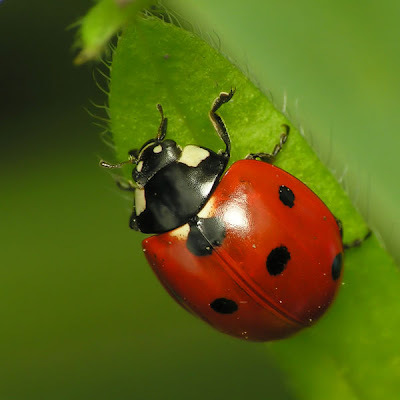 Although most ladybugs are beneficial to plants, some of them are considered pests. In a future post I will name those bugs and describe why they are not so "lady-like." Among the first flowers that announce the near arrival of spring is the Japanese magnolia (Magnolia x Soulangiana). Although I might have seen the flowers many times in the past, the first time I came close (close-up) to one was when we visited the mission in San Luis Obispo. There at the entrance was this tree with a stunning display of pink inflorescence while everything else still looked gray. The Japanese magnolia is also commonly known as the saucer magnolia. The huge flowers resemble the shape of tulip flowers that sometimes it is also referred to as tulip tree. However, be careful not to mistake it with the African Tulip Tree (Spathodea campanulata) or the other Tulip Tree (Liriodendron tulipifera). Unlike the Southern magnolia (Magnolia grandiflora) which is an evergreen, the Japanese magnolia is a deciduous plant meaning they lose their leaves in the winter. When the tree resumes its growth, the flowers emerge first making it a beautiful specimen plant. The following pictures were taken in El Dorado Hills near the library. I saw this enemy in the garden today. Although it has not been named as a serious pest in California, snails, along with their relatives the gray garden slug (Deroceras reticulatum, formerly Agriolimax meticulatus) are annoying pests in home gardens especially during this time of the year when the herbaceous plants are just beginning to emerge from the ground. It is easy to mechanically control the snails but I prefer to deal with slugs chemically using metaldehyde (2,4,6,8-tetramethy 1,3,5,7 tetraoxycyclo-octane) in late winter and very early spring. This is the only time I put slug/snail bait in the garden mainly for the purpose of protecting the seedlings. Later on I hand-pick those that survived. This way we can enjoy slug-free strawberries. The brown garden snail is closely related to the Roman Snail (Helix pomiata), the edible snail which is commonly known as Escargot in French cooking. The Philippines has its own edible aquatic snails known as Kuhol or the Channeled Apple-Snail (Pomacea canaliculata). They are aquatic; usually found in rice fields as pests. Recently, it has been found to be good source of feed supplement for livestock and poultry. It's happening...I am slowly being converted into a cymbidium enthusiast! Well, not quite. I only gave in to buying two more orchids from Costco. Just like the other two that I already have, these were not labeled; therefore I could not tell what variety or hybrids they are. I can either do my research and make my best guess or I will just content myself in differentiating them by their colors. After all, I only have four orchids, so far. Last Saturday, Tim and I attended a Cymbidium Show in Sacramento. The cymbidium display was not particularly impressive...maybe because for a neophyte like me, the orchids all looked the same except for color and size. Maybe as I learn more about them that I will also develop the eye to appreciate the variation among varieties. In one corner, however, were old issues of Cymbidium Society of America (CSA) Journals as give-away; I picked up a couple. After reading about an interview with Loren Batchman of Casa De Las Orquideas, it seems like a door has been opened for my imagination to wander. I am now inspired to play around with this genus of the Orchidaceae family. I hope that the challenges of our dry weather condition will not reduce this new excitement into ningas cogon. Sedum 'Autumn Joy' is probably one of the best perennial plants that I've ever planted in my garden. Some may judge a plant by the appearance of the flowers but these is not the case here. My regard for this plant is based from its ability to maintain a beautiful presence throughout the seasons. The plant starts out gray-green (as seen in the picture) and grows up to be upright with increased tinge of yellow. The flowers develop into the summer and last till winter. This plant is drought tolerant which is good for the forgetful gardener. Right now, my Sedum 'Autumn Joy' is just beginning to emerge from the ground. More stems from the same plant emerge every year. I love this picture of new growth-stubs emerging behind the old stems.